A lift or an elevator is consist of 3 major basic parts known as inputs, outputs and controllers. A lift or an elevator is equipped with sensors to check its condition from time to time. A lift or an elevator relies on buttons to receive commands from users. • The hall buttons panel positioned outside of the lift/elevator to allow users to call the lift car/elevator cab. • The floor request button panel normally installed inside lift car/elevator cab, where users press the buttons to input destination floor. • In modern lift/elevator system, there is no hall buttons panel installed outside of the lift/elevator. Instead the floor request button panel is installed outside of the lift/elevator, where users can press button to input the destination floor, and the lift/elevator controller will decide the lift car/elevator cab to serve the users. • The Open-Close door buttons, emergency button and call button are still inside the lift car/elevator in both conventional and modern lift/elevator system. 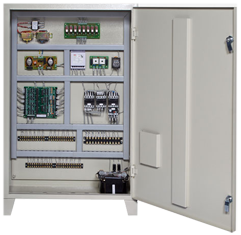 The Key Control are the special panel installed inside a lift car/elevator cab, where it is only used by lift/elevator technicians, engineers and firemen. These authorized individuals can access the key controls to override the system, and take full control on lift/elevator to go up/down, or specific floors. The System Control installed in the control room can turn on/off the entire lift/elevator system at any time any day. The Actuator is a combination of door opening device, electric motor and brakes to control lift/elevator up/down movement, and door open/close mechanism. The Bells refer to emergency bell to alert people outside of the lift/elevator that people are trapped inside and load bell to warn users inside the lift/elevator when the car is overloaded. The Display could be in the car position display, to indicate floors currently on and the moving direction. The direction display is installed outside the lift car/elevator cab to indicate the lift/elevator current moving direction. The controller is a device to monitor, to receive commands and to analyse traffic of lift/elevator. 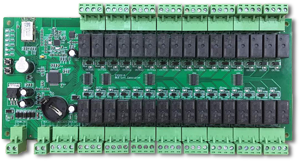 The controller receives signals/commands from the input sensors and exchange the data by operating all the other components in the system to work smoothly. The feedback from the magnetic/photo sensor will tell the position of the lift car/elevator cab to the controller. The controller then analyses the traffic and justifies the lift/elevator operations to cut down the waiting time. The information is then displayed on the in car display panel and the direction panel outside of lift/elevator. The controller interacts with the components inside the lift car/elevator cab to ensure users’ safety at all times. The load sensor will send an overweight alert to the controller for it to trigger the in-car speaker to alert users. At the same time, the controller commands the door to remain opens until the load reduces to acceptable working weight. The emergency bell is installed for the trapped users to call for rescue. When a user presses a button on the floor request button panel, the panel will send the command to the DFRS Panel. It will command the lift/elevator controller to go to the destination floor. Under this operation, whoever manages to access to the lift/elevator can press the button to access to any floor, which is a security threat. To minimize this threat, the management can put a gate/door with electronic access control to keep away intruders from accessing the lift/elevator. Meanwhile, the system integrator can deploy electronic access control on top of the floor request button panels, where a user must validate his/her credential before pressing the floor button. These solutions can minimise the threat but they are quite costly and troublesome. The security threat is on the Floor Request Button Panel. Hence, to overcome this threat effectively, the BLE-16 Lift Relay Control Panel shall be installed in between the Floor Request Button Panel and the DFRS Panel. The Floor Request Button Panel then will no longer be connected to the DFRS Panel, to disallow intruder to access to any floors. The BLE-16 Lift Relay Control works with mobile app via Bluetooth connection, or Bluetooth Smart Card. A user selects her destination floor from a mobile app and the BLE-16 Lift Relay Control will receive and translate the commands into the destination floor command to send to DFRS Panel. At the same time, the BLE-16 Lift Relay Control commands the Floor Request Button Panel to lit up the floor button, as indication for the user. In case the user does not have the mobile app, he/she can use the Bluetooth Smart Card to perform the same operation. The user’s floor access levels are controlled by the i-Neighbour system, where administrator can set up Home floor (location of the user’s unit), Facility floor (locations that user can visit such as gym, swimming pool and etc), and Lobby for each user. The setup then be downloaded into individual’s mobile app and will be automatically updated by itself in case any changes are done to the system. For users without a mobile app, an administrator can write the data into a Bluetooth Smart Card, which consists of 3 buttons to represent Home Floor, Facility Floor and Lobby. User only needs to press the button when entering into a lift car/elevator cab to send command to the BLE-16 Lift Relay Control. For visitors, an administrator can write the Visiting Floor, Lobby and effective date/time range into the Bluetooth Smart Card, and the visitor can use the card to access to the visiting floor and lobby only. This visitor pass can only work between the effective time range. The BLE-16 Lift Relay Control is designed to intercept between the floor request button panel and the destination floor reservation system (DFRS) to improve the security levels of lift/elevator access. Now, it is installed onto the floor request button panel and DFRS panel but there is no changes to the entire lift/elevator system.